The Savior of the world, Jesus Christ, said of those who would be part of His Church: “Be one; and if ye are not one ye are not mine” (D&C 38:27). And at the Creation of man and woman, unity for them in marriage was not given as hope; it was a command! “Therefore shall a man leave his father and his mother, and shall cleave unto his wife: and they shall be one flesh” (Genesis 2:24). Our Heavenly Father wants our hearts to be knit together. That union in love is not simply an ideal. It is a necessity. The requirement that we be one is not for this life alone. It is to be without end. The first marriage was performed by God in the garden when Adam and Eve were not subject to death. He placed in men and women from the beginning a desire to be joined together as man and wife forever to dwell in families in a perfect, righteous union. He placed in His children a desire to live at peace with all those around them. But with the Fall it became clear that living in unity would not be easy. Tragedy struck early. Cain slew Abel, his brother. The children of Adam and Eve had become subject to the temptations of Satan. With skill, hatred, and cunning, Satan pursues his goal. It is the opposite of the purpose of our Heavenly Father and the Savior. They would give us perfect union and eternal happiness. Satan, Their enemy and ours, has known the plan of salvation from before the Creation. He knows that only in eternal life can those sacred, joyful associations of families endure. Satan would tear us from loved ones and make us miserable. And it is he who plants the seeds of discord in human hearts in the hope that we might be divided and separate. All of us have felt something of both union and separation. Sometimes in families and perhaps in other settings we have glimpsed life when one person put the interests of another above his or her own, in love and with sacrifice. And all of us know something of the sadness and loneliness of being separate and alone. We don’t need to be told which we should choose. We know. But we need hope that we can experience unity in this life and qualify to have it forever in the world to come. And we need to know how that great blessing will come so that we can know what we must do. “As thou hast sent me into the world, even so have I also sent them into the world. “And for their sakes I sanctify myself, that they also might be sanctified through the truth. “That they all may be one; as thou, Father, art in me, and I in thee, that they also may be one in us: that the world may believe that thou hast sent me” (John 17:18–21). In those few words He made clear how the gospel of Jesus Christ can allow hearts to be made one. Those who would believe the truth He taught could accept the ordinances and the covenants offered by His authorized servants. Then, through obedience to those ordinances and covenants, their natures would be changed. The Savior’s Atonement in that way makes it possible for us to be sanctified. We can then live in unity, as we must to have peace in this life and to dwell with the Father and His Son in eternity. The ministry of the apostles and prophets in that day, as it is today, was to bring the children of Adam and Eve to a unity of the faith in Jesus Christ. The ultimate purpose of what they taught and of what we teach is to unite families: husbands, wives, children, grandchildren, ancestors, and finally all of the family of Adam and Eve who will choose the way of unity. You remember the Savior prayed, “For their sakes”﻿—speaking of the Apostles﻿—“I sanctify myself, that they also might be sanctified through the truth” (John 17:19). The Holy Ghost is a sanctifier. We can have Him as our companion because the Lord restored the Melchizedek Priesthood through the Prophet Joseph Smith. The keys of that priesthood are on the earth today. By its power we can make covenants which allow us to have the Holy Ghost with us constantly. Where people have this Spirit with them, we may expect harmony. The Spirit puts the testimony of truth in our hearts, which unifies those who share that testimony. The Spirit of God never generates contention (see 3 Nephi 11:29). This Spirit never generates the feelings of distinction between people which lead to strife.1 Heeding the Holy Ghost leads to personal peace and a feeling of union with others. It unifies souls. A unified family, a unified Church, and a world at peace depend on unified souls. Even a child can understand what to do to have the Holy Ghost as a companion. The sacramental prayer tells us. We hear it every week as we attend our sacrament meetings. In those sacred moments we renew the covenants we made at baptism. And the Lord reminds us of the promise we received as we were confirmed members of the Church﻿—the promise that we might receive the Holy Ghost. Here are those words from the sacramental prayer: “They are willing to take upon them the name of thy Son, and always remember him and keep his commandments which he has given them; that they may always have his Spirit to be with them” (D&C 20:77). We can have His Spirit by keeping that covenant. First, we promise to take His name upon us. That means we must see ourselves as His. We will put Him first in our lives. We will want what He wants rather than what we want or what the world teaches us to want. As long as we love the things of the world first, there will be no peace in us. Holding an ideal for a family or a nation of comfort through material goods will, at last, divide them.2 The ideal of doing for each other what the Lord would have us do, which follows naturally from taking His name upon us, can take us to a spiritual level which is a touch of heaven on earth. Second, we promise always to remember Him. We do that every time we pray in His name. Especially when we ask for His forgiveness, as we must do often, we remember Him. At that moment we remember His sacrifice that makes repentance and forgiveness possible. When we plead, we remember Him as our advocate with the Father. When the feelings of forgiveness and peace come, we remember His patience and His endless love. That remembering fills our hearts with love. We also keep our promise to remember Him when as families we pray together and when we read the scriptures. At family prayer around a breakfast table, one child may pray for another to be blessed that things will go well that day in a test or in some performance. When the blessings come, the child blessed will remember the love of the morning and the kindness of the Advocate, in whose name the prayer was offered. Hearts will be bound in love. We keep our covenant to remember Him every time we gather our families to read the scriptures. They testify of the Lord Jesus Christ, for that is and always has been the message of prophets. Even if children do not remember the words, they will remember the true author, Jesus Christ. President Clark went on: “When we partake of the Sacrament we covenant to obey and keep his commandments. There are no exceptions. There are no distinctions, no differences.”3 President Clark taught that just as we repent of all sin, not just a single sin, we pledge to keep all the commandments. Hard as that sounds, it is uncomplicated. We simply submit to the authority of the Savior and promise to be obedient to whatever He commands (see Mosiah 3:19). It is our surrender to the authority of Jesus Christ that will allow us to be bound as families, as a Church, and as the children of our Heavenly Father. The Lord conveys that authority through His prophet to humble servants. Then faith can turn our call as a home teacher or a visiting teacher into an errand from the Lord. We go for Him, at His command. An ordinary man and a teenage junior companion go into homes expecting that the powers of heaven will help them assure that families are united and that there is no hardness, lying, backbiting, nor evil speaking (see D&C 20:54). Faith that the Lord calls servants will help us ignore their limitations when they reprove us, as they will. We will see their good intent more clearly than their human limitations. We will be less likely to feel offense and more likely to feel gratitude to the Master, who called them. “There was a deathly silence, then a subdued voice whispered, ‘I am sorry.’ ”5 An inspired, loving rebuke can be an invitation to unity. Failure to give it when moved upon by the Holy Ghost will lead to discord. If we are to have unity, there are commandments we must keep concerning how we feel. We must forgive and bear no malice toward those who offend us. The Savior set the example from the cross: “Father, forgive them; for they know not what they do” (Luke 23:34). We do not know the hearts of those who offend us. Nor do we know all the sources of our own anger and hurt. The Apostle Paul was telling us how to love in a world of imperfect people, including ourselves, when he said, “Charity suffereth long, and is kind; charity envieth not; charity vaunteth not itself, is not puffed up, doth not behave itself unseemly, seeketh not her own, is not easily provoked, thinketh no evil” (1 Corinthians 13:4–5). And then he gave solemn warning against reacting to the faults of others and forgetting our own when he wrote, “For now we see through a glass, darkly; but then face to face: now I know in part; but then shall I know even as also I am known” (1 Corinthians 13:12). The sacramental prayer can remind us every week of how the gift of unity will come through obedience to the laws and ordinances of the gospel of Jesus Christ. When we keep our covenants to take His name upon us, to remember Him always, and to keep all His commandments, we will receive the companionship of His Spirit. That will soften our hearts and unite us. But there are two warnings which must come with that promise. First, the Holy Ghost remains with us only if we stay clean and free from the love of the things of the world. A choice to be unclean will repel the Holy Ghost. The Spirit dwells only with those who choose the Lord over the world. “Be ye clean” (3 Nephi 20:41; D&C 38:42) and love God with all your “heart, … might, mind, and strength” (D&C 59:5) are not suggestions but commandments. And they are necessary to the companionship of the Spirit, without which we cannot be one. The other warning is to beware of pride. Unity which comes to a family or to a people softened by the Spirit will bring great power. With that power will come recognition from the world. Whether that recognition brings praise or envy, it could lead us to pride. That would offend the Spirit. But there is a protection against pride, that sure source of disunity. It is to see the bounties which God pours upon us not only as a mark of His favor but an opportunity to join with those around us in greater service. A husband and his wife learn to be one by using their similarities to understand each other and their differences to complement each other in serving one another and those around them. In the same way, we can unite with those who do not accept our doctrine but share our desire to bless the children of our Heavenly Father. We can become peacemakers, worthy to be called blessed and the children of God (see Matthew 5:9). God our Father lives. His beloved Son, Jesus Christ, is the head of this Church, and He offers to all who will accept it the standard of peace. May we all live worthy of that standard. See Joseph F. Smith, Gospel Doctrine, 5th ed. (1939), 131. See Harold B. Lee, Stand Ye in Holy Places (1974), 97. In Conference Report, Apr. 1955, 10–11. See David O. McKay, in Conference Report, Oct. 1967, 7–8. Teachings of Presidents of the Church: Spencer W. Kimball (Melchizedek Priesthood and Relief Society course of study, 2006), 157. On separate pieces of paper, write the three promises we make each week as we partake of the sacrament. As you hold each paper up, discuss what the promise means and how we can fulfill it. Before your visit, cut a paper heart into three pieces and label them Change, Companionship, and Faith. Begin by explaining that we are to become unified and of one heart. Then lay down the “Change” piece. 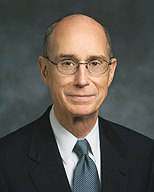 Read or explain what President Eyring meant by changing our natures, and have the family give examples of changing. Repeat the same process with the other two pieces. Having completed the heart puzzle, ask the family for ways that they can become of one heart. Read, or have family members read, parts of the first two sections of the message. Talk about how a family, although made up of individuals, can be united. Show that a single piece of thread can be easily broken but that many threads wrapped together are stronger. Emphasize that a family is stronger when united.